This year we’re focused on innovation in the area of adult students, where the institutional “slow learner” problem is especially severe. The share of college students who are adults—defined as twenty-five years old or older—is now about 40 percent. But most colleges haven’t adapted. For instance, they still schedule the majority of classes around midday, which is convenient for late-night-partying undergrads, rather than at night and on weekends, when grownups with jobs and families can actually attend them. As you’ll see in the profiles below—and in our ranking of the best colleges for adult learners (introduction here; rankings begin here)—elite colleges don’t make the cut. Despite supposedly having the cleverest professors and students, they tend to be the slowest learners when it comes to serving adult students. It’s the unheralded schools, the kind U.S. News and other gatekeepers don’t notice or celebrate, that are figuring it out. Not all of the schools below made it onto our top 100 lists; a few were not even within shouting distance. But they are all doing something right that other schools ought to emulate. But over the past five years, Odessa has improved dramatically. Metrics are way up across the board, enough to place it at number 209 (out of the nearly 1,300 two-year schools we looked at) on our list of the best colleges for adult learners. It also caught the attention of the Aspen Institute, placing as a finalist for this year’s Prize for Community College Excellence. According to school officials, the improvement was due to two simple yet significant changes to the school’s structure and teaching method. First, in 2011, Odessa targeted teaching with its Drop Rate Improvement Program. Through internal research, the administration had discovered that while personal and financial issues contributed to students’ decision to drop classes—in turn making them more likely to drop out of school altogether—having good relationships with instructors could overcome those factors. After studying what instructors with high retention rates were doing differently from instructors with low retention rates, the school identified four practices of successful teachers, which Odessa turned into a four-pillar teaching framework: use students’ names from the first day of class onward; intervene early if a student is having obvious problems (like falling asleep in class, or failing the first exam); meet one on one with students at least once per term, preferably early; and lay out clear expectations and penalties in the syllabus, while judging infractions on a case-by-case basis. New instructors are trained in this framework. Second, in 2014, Odessa transitioned all of its core courses—80 percent of its offerings—from sixteen-week semesters to two eight-week terms, something no Texas school had ever done. The idea was to double the number of opportunities students have to enroll in classes and increase the course completion rate. Instead of taking four or five classes in a sixteen-week term, full-time students take just two classes per eight-week term; part-time students take just one. The class hours are doubled in order to fit sixteen weeks of curriculum into eight weeks, which allows students to still qualify for Pell Grants. To help students manage the increased classroom hours, Odessa offers courses at various times of day and on weekends. The first semester with eight-week terms yielded the largest enrollment in Odessa’s seventy-one-year history, and the numbers have grown each year since—even though regional unemployment is low. The school also saw a 4 percent increase in course completion and a 3 percent increase in student success (earning a C- or higher) a year after implementation. Offering eight-week terms and improving instruction both got students in the classroom and made it easier for them to stay. The course completion rate is now over 90 percent, up from around 85 percent. Odessa has also experienced a dramatic increase in annual graduation/transfer rates, from 15 percent to 32 percent in five years. And achievement gaps are shrinking. Hispanic men were historically among the lowest-performing student groups at Odessa. But now they complete 96 percent of the classes they start, get at least a C in 78 percent of those classes, and have more than doubled their graduation rate in the last five years. University of Maryland University College (UMUC), a member of the University of Maryland system that offers fully online and hybrid degrees, is once again ranked in our top 100 four-year schools for adult learners, thanks to its large adult student population, low tuition costs, and high average earnings for graduates. But what those numbers don’t capture is UMUC’s reputation for serving military and veteran students at home and abroad. The college was founded in the wake of World War II with the intent of serving returning veterans, and it was the first university to send professors overseas to offer classes to active-duty service members. Now that was distance learning. Shortly after joining UMUC in September 2015, Keith Hauk, the associate vice president of veterans initiatives, visited the University of Maryland, College Park (Maryland’s flagship public university), for a meeting with that school’s ROTC detachment. Hauk, himself a veteran, passed through the school’s veterans’ lounge and found five students sitting together, trying to figure out how to get through their calculus course. UMUC has a lounge on its campus, but because the vast majority of students who use veterans’ benefits take classes online, it wasn’t serving military students the way College Park’s was serving theirs. That got Hauk thinking about how to build something like a virtual student union for UMUC’s online military student body. Last summer, Hauk’s vision came to fruition as the MIL-VET Checkpoint, a web tool dedicated to helping UMUC students about to leave the military make a successful transition to civilian life. It connects veterans and service members with other veterans, veterans’ counselors, and information about job opportunities and academic resources. That’s just one of several recent UMUC veteran initiatives. The VA maintains the right to repossess any education benefit money from a student who doesn’t maintain good academic standing, and from the school he or she is attending. UMUC found that the courses most responsible for subpar academic performances were general education math and writing requirements. So the school partnered with Tutor.com to provide free tutoring to students using their VA benefits. More internal research showed that a significant portion of veterans faced gaps between the full cost of school and their federal financial aid and VA benefits. In response, UMUC established the Veterans Assistance Fund, which also helps cover prior learning assessments and provides up to $3,000 of supplemental income to students who work in a low-pay or unpaid internship in their industry of choice. “Oftentimes, these funds make the difference between dropping out of school or not,” says Kelly Wilmeth, vice president of UMUC’s stateside military operations. It’s well established that early childhood education is crucial to child development and academic achievement, which has implications well into adulthood. In an effort to improve the quality of that education, multiple cities and states—including Pennsylvania and Washington, D.C.—have passed legislation requiring early educators to have a college degree. But the average associate’s degree costs around $10,000 a year, and a bachelor’s about $25,000. That’s a steep entry price for a profession that pays a median wage of $14 an hour. Philadelphia-based nonprofit, dusted off an old idea: an early childhood educator apprenticeship program. (She had led the creation of a statewide program from 2000 to 2004, but the funding dried up.) Feldman connected with Amy Saia, an assistant professor of early childhood education at the Community College of Philadelphia (CCP). Thus began a two-year planning process that paid off this year when the apprenticeship program finally launched. As of this writing, there are thirty-six apprentices and nineteen participating employers, including nonprofit, for-profit, union, and nonunion. Completion of the two-year program will result in a certificate from the U.S. Department of Labor, an associate’s degree, and lead teacher certification for Philadelphia-area early childhood education centers. The apprentices will complete 4,000 hours of on-the-job learning with the help of a worksite mentor and will receive college credits as well as wages. They face limited out-of pocket costs (they are sponsored by their employers), and earn progressively higher pay as they advance through the program. A specialized transfer program lets qualifying apprentices who graduate from CCP earn a bachelor’s degree at Drexel debt-free. We often think of education in terms of time. An associate’s degree is usually described as a two-year degree, a bachelor’s as a four-year. But on average, full-time students take 3.3 years to earn an associate’s and 5.7 years to earn a bachelor’s. This slow pace deters many from ever getting the degree at all: the longer the time to degree, the higher the dropout rate. The problem is that earning a degree typically requires accumulating enough “credit hours,” a measure of the amount of time spent in a classroom. That’s hard for adults, who are often juggling work and family. In recent years, education policy thinkers have begun to reconsider the wisdom of the credit-hour system. Instead of seat time, wouldn’t it be better to award credit based on what students have actually learned? This model has come to be called “competency-based education.” In CBE, students move at their own pace and advance by showing mastery of specific knowledge and skills (“competencies”) on exams designed by subject-matter experts. Adults with work experience can convert knowledge learned on the job into college credit through exams or portfolios of past work, judged using prior learning assessments. Despite its clear promise, very few colleges have implemented CBE on a broad scale. Why? Because federal financial aid eligibility is generally based on the credit-hour system. Without that eligibility, schools run the potentially fatal risk of limiting their applicant pool to people who can pay without federal loans. The Obama administration tried creating ways for schools to get permission to implement CBE without losing access to aid, but the processes proved too slow or onerous for most colleges. But innovators often take risks, which is how Salt Lake Community College (SLCC) ended up on our list. Since 2014, using a $2.3 million federal grant, SLCC has converted twenty programs in its School of Applied Technology (SAT) to CBE—even though there was no guarantee they would get approved for federal aid. SAT is devoted to one-year or shorter programs that provide training in high-demand, high-paying jobs. Instead of scheduled classes, students are only required to appear in lab once a week, though the vast majority exceed that requirement. SAT students are about thirty-five years old on average, so they often arrive with relevant experience in their field, which they can use to skip redundant course work. Gone are traditional sixteen-week semesters; a student earns her certification as a network engineer, for instance, as soon as she demonstrates competency in all the required skill areas, such as server installation and configuration. “It removes time as the constant of learning, and makes learning the constant and time the variable,” said Eric Heiser, the dean of SAT. SLCC implemented this expansive CBE program despite a painfully slow process to receive permission from the U.S. Department of Education to give financial aid. “We weren’t going to be held up by federal regulations,” Heiser recalled. SLCC stuck with the process and finally received permission this past July. They’re only one of around a half-dozen schools to have made it through. No discussion about innovation in higher education for adult learners would be complete without mentioning Southern New Hampshire University, another pioneer in competency-based education. A repeat top-fifty school in our rankings, with a 70 percent adult student body, SNHU made waves in 2014 when it began offering bachelor’s degrees through its College for America, a fully online college exclusively devoted to offering CBE to working adults. Martha Rush-Mueller, director of public/non-profit partnerships at SNHU, helped create College for America’s business model, which relies on partnerships with employers. A few years ago, while thinking about potential partnerships, it occurred to her that she had ignored the biggest employer in America: the federal government, which directly employs 2.8 million civilians, including the Postal Service. Rush-Mueller reached out to the Office of Personnel Management and began a two-year process of establishing a partnership. The federal government has a talent problem. Fifty years of small-government dogma have kept it from expanding to meet the growing demands placed on it. Without the ability to hire enough new staff, it’s often up to existing federal workers to keep up with changing responsibilities. They don’t always succeed. This has direct costs for taxpayers. Acquisitions officers are often overwhelmed by the size and complexity of contracts, which leads to overspending on subpar products and services (see, for example, the F-35 fighter jet). And with Medicare and Medicaid responsible for a quarter of federal spending, there’s a need for workers to be educated in health care management. Bunker Hill (BHCC) is Massachusetts’s biggest community college, serving 13,000 students in Boston, and just breaks the top fifty in our best colleges for adults. BHCC has taken a particularly innovative approach to a problem that is startlingly common among community college students: hunger. According to a recent study, 67 percent of community college students in America are “food insecure”—that is, they lack consistent access to food. Thirty-three percent are regularly hungry. BHCC’s student body is no exception to this national crisis. Nearly half of students skip meals, or eat less than they’d like to, because they don’t have enough money. It’s hard to succeed in school when you can’t afford to eat. So BHCC has implemented a number of programs to feed its students. Last year it initiated the One Solid Meal program, which provides free cafeteria meals or food gift cards to students. Unsurprisingly, the school found that participation in the program correlated strongly with academic completion. BHCC also partners with Panera, which delivers loaves of unpurchased bread, and local universities, who freeze leftover cafeteria food into TV-dinner-style packages. The college has an on-campus branch of Single Stop, a national nonprofit organization that provides a one-stop shop where people can access resources on health care, taxes, housing, food, and financial aid. To further reduce costs for its students, BHCC joined the Open Educational Resources (OER) Degree Initiative, a growing national effort to create college courses and degree programs that use only freely accessible, openly licensed textbooks and other media instead of the usual expensive proprietary materials. It was 2009, and then Indiana Governor Mitch Daniels was trying to figure out how to expand the state’s public higher education system to include online offerings. At the time, Indiana placed forty-second among states in the proportion of adults with a postsecondary credential. Building Indiana-specific online universities would solve two problems. The first was one of perception. People, in particular adult learners, are often bound to a sense of place. An online university, by definition, has no place, and continues to be perceived as having less legitimacy and lower standards than a brick-and-mortar school. But a state-branded online school would gain legitimacy while also solving the second problem: embedding it within a state higher ed system, thereby giving online students access to existing public resources like grants and aid and making transfers between schools easier. But Indiana, like other states at the time, wasn’t making much headway: building an online university from scratch required inordinate amounts of time, money (in the midst of a recession), and political buy-in from existing institutions. Then Daniels met with Robert Mendenhall, then the president of Western Governors University. WGU was founded twenty years ago by then Utah Governor Mike Leavitt and twelve other governors, mostly from western states. A nonprofit online university that pioneered the use of competency-based education, WGU’s founding mission was to provide an affordable distance-learning alternative to adults who had never finished college. Students are tutored, not taught in formal classes, and can earn credits whenever they demonstrate competency in subject areas. Today, 93 percent of WGU’s students are adults—the average age is thirty-six—and tuition is just over $6,000, half the national average. One of its first programs was an online CBE teachers’ college; the secondary math education program was ranked best in the country by the National Council on Teacher Quality in 2014. A 2016 Gallup poll found that recent WGU graduates have an 81 percent employment rate. In WGU, Daniels found his solution. Scott Jenkins, at the time Daniels’s education policy director, was in the room for the meeting with Mendenhall. “Mitch immediately got it. He asked Mendenhall, ‘Could we brand that for Indiana? Could we charter WGU for Indiana and make WGU Indiana’s online university?’” That’s precisely what happened in June 2010 when Daniels signed an executive order establishing WGU Indiana as “Indiana’s eighth state university,” as he called it. WGU Indiana is more a brand than its own university; the academic programs and the curriculum are done out of Salt Lake City. All that changed was the creation of a WGU Indiana administration in Indianapolis to work within the state’s system. The results have been excellent. Enrollments to WGU doubled between 2011 and 2015, and the number of WGU graduates has increased by an average of 97 percent every year between 2011 and 2015. The average time to a bachelor’s is two and a half years. Daniels’s idea has since been replicated in Washington, Texas, Missouri, Tennessee, and Nevada. Each state saw a significant increase in enrollment, and number of graduates, after announcing their respective affiliations. Teaming up with WGU might be the most cost-effective, least politically fraught way to bring online CBE to the state level. You are the owner of a small but growing business. You need to hire someone who knows how to use QuickBooks, an accounting software platform. Two résumés land on your desk. Both candidates just graduated from community colleges with associate’s degrees in accounting technology and have similar transcripts. None of that tells you if either one knows how to use QuickBooks, and you’re not about to go digging into course catalogs to find out. But then you notice in one résumé—the one that lists Broward College under education—the following item: QuickBooks Certified User. That is an industry certification, which means that the applicant passed an exam created by the makers of QuickBooks (Intuit Inc.) that tests proficiency in their software. Your hiring decision is suddenly easy. Industry certifications tell employers what academic credentials alone do not: proof of professional proficiency in a certain skill. They are usually created by industry associations, like the American Welding Society, but sometimes by specific companies, like Intuit. Employers in applied technical fields like manufacturing and information technology tend to want workers who can use particular tools. Community colleges, meanwhile, are supposed to give their graduates marketable skills. The problem is that employers have to take the college’s word for it that those recent graduates actually have the skills they need. To address this gap between the academy and the job market, in 2013 Florida expanded existing state law to reward postsecondary institutions financially for the number of certifications its students earn. And for the last four years, Broward College—which placed a respectable seventy-fourth in our rankings—has led the state in the number of industry certifications earned by students. As the biggest community college in the state (Broward enrolls about 63,000 students), it had a huge built-in advantage. What’s impressive is how quickly it’s expanding its certification efforts. During the 2016–17 academic year, Broward students earned 1,339 certifications, a dramatic increase from the 147 earned in the 2013–14 school year. Part of that success comes from embedding industry certifications into programs of study so that students earn industry certifications while completing their academic program. One popular way of embedding: making an industry certification exam a class’s final exam and covering the cost of the examination fee with vouchers. Broward is also “stacking” certifications—aligning the order of their course work to correspond with the order of certifications students need. Someone studying to be a network security specialist, for example, will first pass the Cisco Certified Entry Networking Technician exam, a prerequisite to the Cisco Certified Network Associate Security exam. This approach means that students who drop out are more likely to at least have a credential with value on the job market. That matters, because Broward’s graduation rate, while higher than the national average for community colleges, is still only around 30 percent. Last year’s 1,339 certifications have translated into almost $1.1 million in performance funding from the state. Though not required to do so, Broward returns 50 percent of those funds to its departments. The IT department, which was not getting as many students certified as other departments, used some of its money to create an IT boot camp where students get to collaborate with each other and faculty members for four days prior to taking certification exams. According to the school, the department saw a 300 percent increase in industry certifications last year. Prior learning assessments are close to being standard at any school claiming to be great for adult learners. The concept is simple enough: if you walk into school with previous academic and/or work experience, PLAs allow schools to gauge what you know and translate it into credits toward your degree. This saves students time and money. That’s basically how Texas A&M University–Texarkana (TAMUT) was using PLAs when Lisa Myers arrived in 2013 to start work as an administrator and adult education instructor. But after doing some research, Myers realized that the model’s focus on letting teachers measure what a student already knew was missing something important: the chance for students to learn something new. So she set about refreshing the PLA model. Today, TAMUT students use PLAs to think about their learning, often in the form of reflective essays, and analyze it using adult learning theory and models. This new model recognizes and enhances more soft skills, like conflict resolution and time management, which a body of psychological and economic research shows are crucial to success in any occupation. The school has also folded in PLA assessments, which usually cost students between $125 to $250 out of pocket, into the overall cost of tuition, which allows financial aid to cover the cost. Most adults who go back to school are trying to enhance their job prospects. They trust that their school knows enough about the labor market to prepare them accordingly. But that trust can be misplaced. Like armies prepared to fight the last war, not the next one, colleges too often create programs of study preparing students for the last economy, even while marketing themselves as being responsive to current trends. 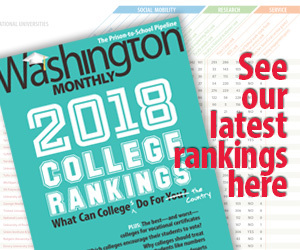 Monroe Community College in Rochester, New York, comes in almost exactly in the middle of our rankings, but it is at the cutting edge of making college more responsive to changes in the labor market. In response to the devastation that the Great Recession wrought in Rochester, Monroe’s president formed a new office, the Economic Development and Innovative Workforce Services Division, and hired Todd Oldham to lead it. Its goal was to gather information about the regional economy and use that data to help Monroe’s programs keep up with economic demands. “All the talk [from local businesses at the time] was skills gaps,” Oldham said. But the information was largely anecdotal. So he started digging around. Since its founding, the division has created a database of approximately 2,400 businesses in the Rochester area and has conducted detailed surveys on things like what positions need filling and what skills are most desired. It has also mined employment statistics from local and state government sources and job-posting sites, and has tracked where graduates of Monroe and other nearby colleges find jobs. The result is granular real-time data on the regional labor market for four workforce “clusters”: advanced manufacturing, applied technologies, health care, and information and computer technology. Not at Chaffey College. In 2013, Cindy Walker, the college’s faculty success center facilitator, was looking for ways to improve teaching effectiveness at Chaffey. The school primarily serves minorities, many from low-income backgrounds, in the Los Angeles area. Chaffey was underwhelmed by the results of an initiative focusing on study skills in the classroom. After reading some research on the psychology of hope, Walker began to suspect that there was something deeper sapping students’ motivation. Did students fundamentally believe that they belonged in college and could succeed? Walker attended a workshop led by Dweck, and something clicked. “I saw that a lot of those concepts and strategies around mind-set were very complementary to the research around hope, and it filled in some gaps,” Walker said. For the next two years, she held workshops of her own to train teachers and talk to students. She met with administrators, too, including the admissions and financial aid offices and even the library staff and tutors. The result is that growth mind-set has become baked into how Chaffey functions. It’s in the school’s new mission statement, and administrators refer to it when doing strategic planning. One example is Chaffey’s faculty advising program. Internal research found that students wanted more career guidance. The faculty advising program matches students with particular career interests to faculty with corresponding expertise. The faculty are trained in helping students cultivate Dweck-esque mind-set. In fact, the commitment to growth mind-set affects how syllabi are structured (less crime and punishment, more goal setting) and even how word problems in tests are presented (actual example from a biology class: “You are a thriving paleontologist and need to share this concept with colleagues . . .”). All of this has contributed to Chaffey’s recent successes. The number of degrees awarded to Hispanic Chaffey College students increased by 31 percent only one year after Walker began introducing growth mind-set. This year, Chaffey graduated its largest class ever and the school was listed as an Aspen Prize finalist. University of Wyoming is a repeat top-twenty school for adult learners in our rankings. It stands out for its affordability (ranked second overall among four-year schools), its high loan repayment rate (73 percent), and its services for adults, who make up nearly a third of the student body. UW has an adult student council and a dedicated “nontraditional student center” with a staff dedicated to connecting older students with academic and economic resources. But the university recently identified a shortcoming. UW is the only four-year public institution in the state, and more than 60 percent of Wyoming postsecondary students begin their studies at one of the state’s seven public community colleges, the highest rate in the country. For decades, Wyoming has had a statewide course articulation agreement—formal agreements between UW and the community colleges documenting the transfer policies for a specific academic program or degree. Articulation agreements are meant to ensure that students who transfer schools won’t have to repeat course work they’ve already done. The problem is that course articulation does not necessarily translate into credit toward a degree. For example, if a university deems another college’s curriculum to be not as rigorous as its own, a student’s transfer credits may count as electives or general education requirements and not toward his intended major, meaning he will have to repeat material from his community college program in order to graduate. This increases the time and money transfer students have to spend. Administrators at UW realized that they were part of this national problem. Despite those long-standing articulation agreements, UW transfers with associate’s degrees had only a 24 percent two-year graduation rate, and they had on average twenty-one transferred credits that counted as electives rather than degree requirements. Those who did graduate UW earned an average of twenty more credits than students who didn’t transfer—a sign of the extra time and money the system was costing them. So, since 2015, UW has been developing a new kind of articulation agreement, one between corresponding departments at UW and the community colleges, rather than between the institutions as a whole. This allows UW department faculty to work with their counterparts at each corresponding community college department to make sure transfer students are learning the same things as UW freshmen and sophomores. In return, UW allows transfers to apply their class credit toward their UW major. “Students coming in with an associate degree are completely prepared for junior-level course work at UW and are on track to graduate with a bachelor’s in two years,” said Mary Aguayo, the interim vice president for enrollment management.